At Masterpac, we offers a complete line of high performance packing for pumps, valves, and other rotating equipments. Also offer packing for special purpose applications e.g. Thermiculite® packing, Gore® GFO® Packing, and so on. Braided compression packing made from 100% Gore® GFO® fiber offers proven consistent high performance for a wide range of applications and uses, including shafts on high-speed pumps, mixers and agitators. Easy to install and remove, the packing never gets hard or brittle. It outlasts virtually any other packing it replaces. Compared to other PTFE/graphite packings, only those made with Gore® GFO® fiber deliver an unmatched level of assurance and confidence. Look for the Seal of Assurance on every package and 100% GFO printed right on the packing. The new Masterpac packing style MP 8005I5 is made from layers of flexible graphite tape plied into compact strands; reinforced with Inconel wires which is subsequently treated with lubricating agents to reduce stem friction and a corrosion inhibitor to prevent pitting. MP 8005I5 is a high-performance valve packing which typically used in power plants, refineries and similar industries where high pressures and high temperatures are prevailing. 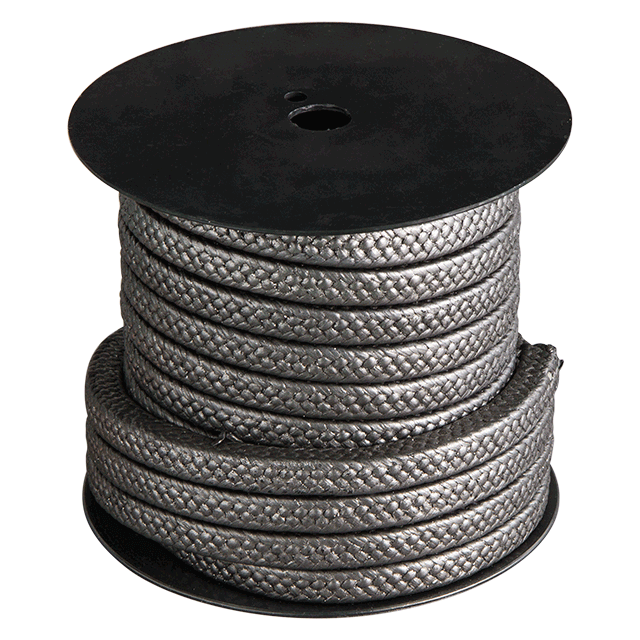 Masterpac MP 8005I is a pure expanded graphite fiber yarn encapsulating inconel wire to avoid steam damage, braided with corrosion inhibitors. MP 8005I is typically in used for steam valve, hot air, super heated water, chemical and petrochemical applications, expansion joints, and high temperature groove packing. Masterpac MP 8005C is a specially blended and braided packing with MP 8005 pure graphite as a base, and re-enforced in all four corners with high strength carbon fiber. This packing is lattice braided as is the carbon achieving maximum strength. Ideally suited to high end valve packing areas where performance is a must. Its applications especially suit to petrochemical and refining, pulp and paper, sugar, and power generation.